This is a preview of a research report from Business Insider Intelligence, Business Insider’s premium research service. Click here to learn more. This is just the beginning. Today, 18 million US consumers have made a voice payment, and Business Insider Intelligence projects that figure will quadruple over the next five years. In a new report, Business Insider Intelligence explores how and why financial services providers such as PayPal and Bank of America are positioning for voice interfaces to take off. The report includes actionable recommendations that draw on interviews with executives spearheading voice initiatives, as well as exclusive survey data from our proprietary research panel. 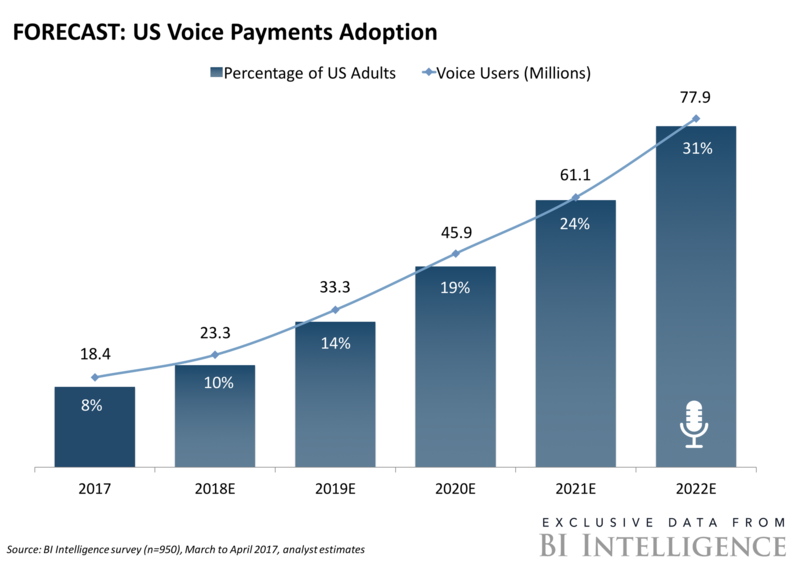 Voice payments are catching on — 8% of US respondents to a 2017 Business Insider Intelligence survey said they used voice commands to buy something, send money to a friend, or pay a bill. Adoption is set to grow from 8% to 31% of US adults by 2022. Three factors will fuel this growth: an explosion of voice-enabled devices, generational gains in AI, and a strong consumer value proposition for voice payments. Payments providers are moving in: Amazon, Apple, Google, and PayPal are part of the growing list of companies making these next-generation payments possible. Banks are betting on AI, too. Bank of America, Capital One, USAA, and more are rolling out conversational interfaces to their customers. Next-generation voice assistants will blow the current generation away. Voice payments will evolve from clunky and poorly scripted sessions to interactions as natural as one might have with a personal shopper or bank employee. Getting to the next generation will not be easy, but the payoff will be large. Grounded in realistic expectations of adoption in the years ahead, providers of voice payments and banking experiences stand to accumulate early advantages by moving in early. Examines growth drivers and barriers to consumers’ voice payments adoption.